A Few Acres of Mud (AFAM) is recruiting field commanders to take part in a Regimental-level combined arm operation in the open terrains of Romania, spring of 1944. The situation will span up to 2 days of combat, the terrain is horrible, mobility and and information are more valuable than ammunition. More details are available to people committing to one side so as not to break operational surprise. The open positions are for commanders either at the Regiment/Brigade OR Battalion level. The sides are the soviet's red army and the coalition of Germany and Romania. Task force commanders may be used sporadically to resolve ASL battles but the positions at this level aren't assigned from the start. Not all positions need to be filled to go forward. The engine used is the ASL rule set, and GURPS where out of ASL's scope. Overall operations will be handled abstractly (NOT in 2-minutes turns) while particular engagements will be resolved using ASL. Mud is in effect, no kidding. Commanders receive reports and issue orders. Players are on the ground, which impacts what they know and can do. The situation is summarized on a map. Players should be available to typically respond a regular time span. Anywhere between a day and a few is fine (it is a game, let's not stress about it while keeping the ball rolling!). No need to be familiar with ASL or GURPS for commanders above Company-level. Understanding of WW2 combined-arm operations and tactics is necessary. Tactical combat will be made of tightly-framed, time limited scenarios on (masterfully crafted) custom maps. The campaign will last for several weeks. If you are interested, contact me by commenting on the post linking here so that I can pass you along my email address. Specify whether you want to play on the Soviet or German side, and whether you want to run at the Company, Battalion or Regiment level. Low Resolution Operational Map: 8km deep X 2 km wide. Romanian Inf Div retreating South of objective BLUE. German armored scouts briefly engaged along Iasi-Targu Frumos road. Possibly NOT elements of 24th panzer Div. SITUATION - GD/Arty have suppressed Soviet AT guns along route HELGA. Ju-88 are covering. 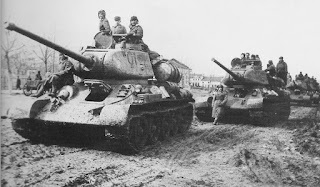 Soviet resistance along route HELGA estimated as 1 AT Company (Coy) and 1 rifle Coy. ORDER - SECURE route HELGA before 1530Z. DESTROY soviet's communication post on Hill 112. INTENTION - A train of supply will depart the assembly area at 1530Z IF the road is secure. This is the last chance to ressuply today. Soviet AT guns must be destroyed or captured so that they cannot be recovered when you withdraw. Panzer Brigade 3 Co has the off-road capability to reach the communication post. 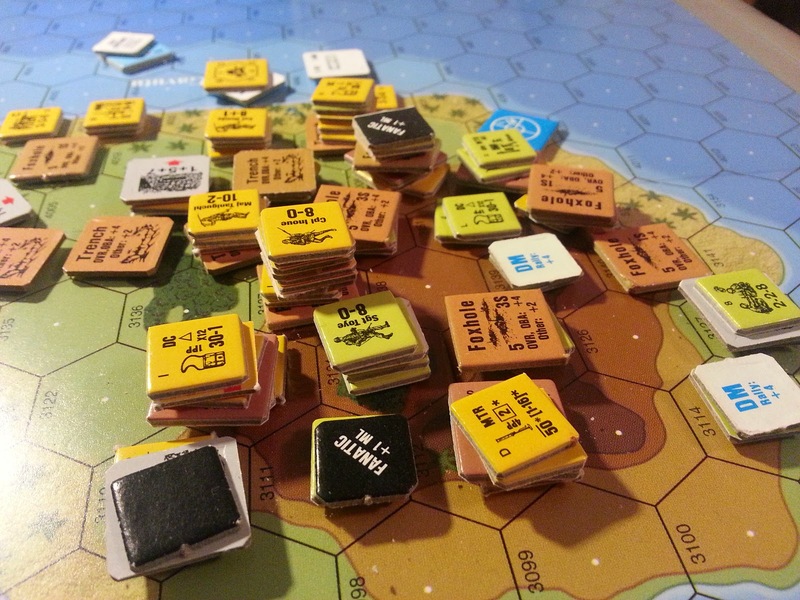 The main challenge in ASL147 is to find and then clear the defenders from the road. In regular ASL, finding is trivial although it should have been the main command challenge. Finding can also be made easy by spreading thin, but then again this would leave the advancing forces vulnerable and too weak to actually do the clearing part. In short, Japan has to sweep and clear the vicinity of the road without being infiltrated to its rear. The Gurkhas have to, one way or another, remain in position such that an ambush on the approaching main columns is possible. I modified the victory conditions to emphasize that this is a game of information as much as a game of elimination. I hope that the scenario proved an exciting new experience for the players. Here are some special rules on detection and command and control. Special Thanks to Stefan Fiedler for playing the MMG crew on turn 7. Japan opted for a larger SAN of 4 instead of a free recon roll. Unfortunately, the IJA a sniper didn't activate during the scenario. The Gurkhas opted for an extra spool of wire. Lt. Samikawa was surprised by Lt. Corhay's choice to defend deeper in the jungle rather than at its edge. 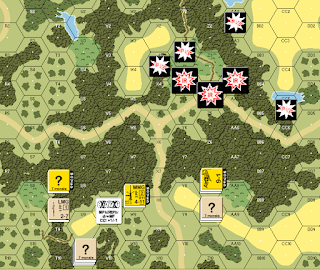 Contact was made late in the scenario as the IJA was cautiously advancing into the deep blue foliage. The IJA conducted a textbook combined operation and got to converge nearly its whole force where it expected the main defensive positions. It found little but a thin screen which melted in the jungle on contact. IR for tank MA fire. By then, Lt. Corhay lost contact with half of its force for the rest of the scenario. 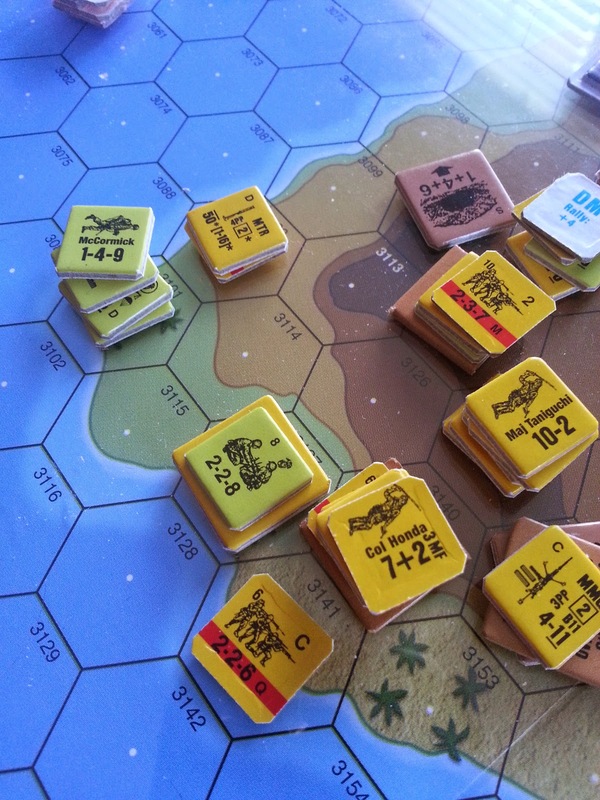 He maneuvered his units that broke under MMG a but rallied fast enough to avert disaster. Some remnants to the south drew most of the IJA a squads, which allowed the, to sneak to the rear and in position to ambush the column of strategically moving IJA armor ( the objective ). This going was high in tense moments such as finding himself HIP ADJACENT to a MMG after all of the broken squads ran past his positions. Across the road, a squad of Gurkhas sneaked through swamp and thicket and slipped into the rear while the rest of the Gurkhas entertained mutual annihilation with Lt. Samikawa's local forces. Samikawa, wounded before the hand to hand, shamefully didn't participated. The IJA, still cohesive under Samikawa, neutralized the remaining Gurkhas such that they cannot impede the progress of the main body. A last minute spread of the IJA ensured that the southern end of the Area of Operation was cleared. 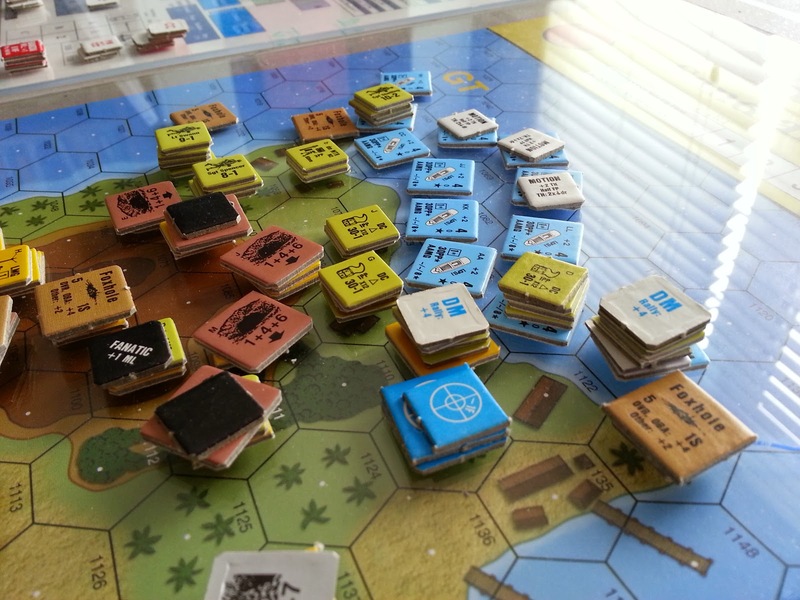 In the very last turn, Lt. Corhay decided to remain HIP as the MMG crew stumbled over their positions. Stripped from HIP, they held fire in hope to go HtH while concealed. The japanese crew shot in the foliage and pinned Corhay himself and one of the squad, the Gurkhas charged but in the confusion the crew slipped out and got away from certain death (The gurkhas needed 11, rolled 12). The victory conditions were adapted to make it more interesting in this context. 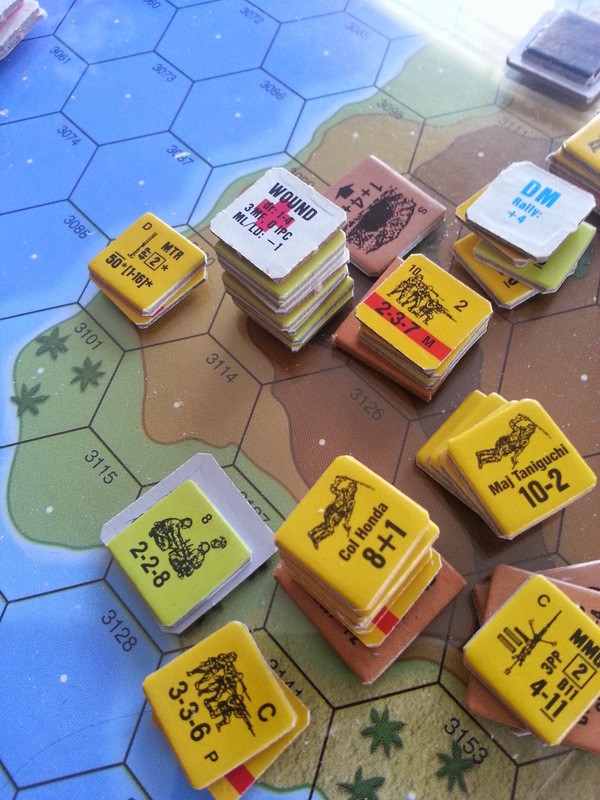 Lt. Samikawa declare the area clear and the Batallion moves forward. Reinforcements comes and help clearing the remaining known Gurkhas. Soon enough, the 3 Tank Bn is passed through and overrun the British defense a few miles down the road. The force commander for scenario larger than platoon-sized should be represented as a SMC in addition to the OOB SMCs. Minimize low-level orders to each units. Keep it high level. Expand in details where the players is personally in danger because it is exciting. Consider adjudicating some situation using GURPS WWII where ASL isn't handling as well at this scale (tracking, stealth, perception (noise)). The jungle is a harsh place to learn to fight blind. This is kind of buying a $20 bottle of wine when you are 17. Keep line of communication clear of interdictable hexes. Find, fix, flank and fight. It starts with a thin screen (find), followed by MG/fire base (fix), maneuver to better approaches [flank], then move on to CC [fight]. 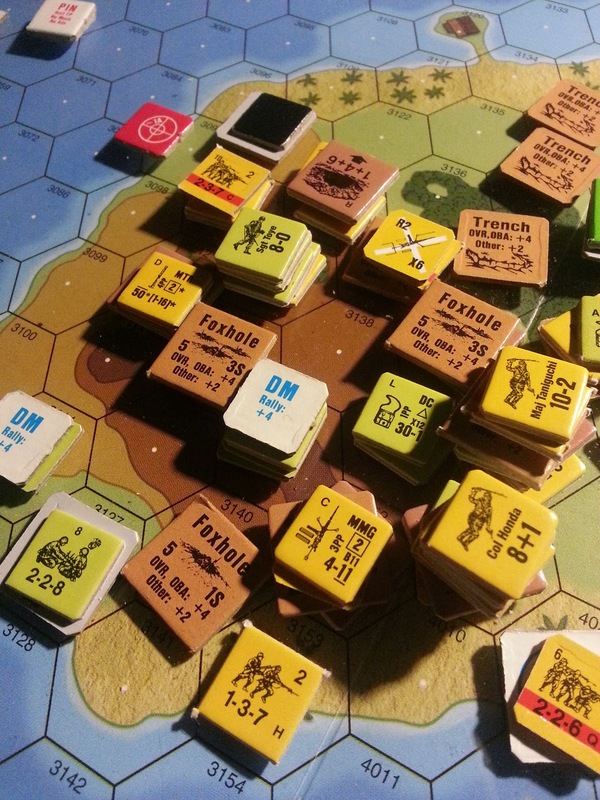 Set objectives, phase lines, fire base so that out of contact units can still act predictably. And thus ends the CG. 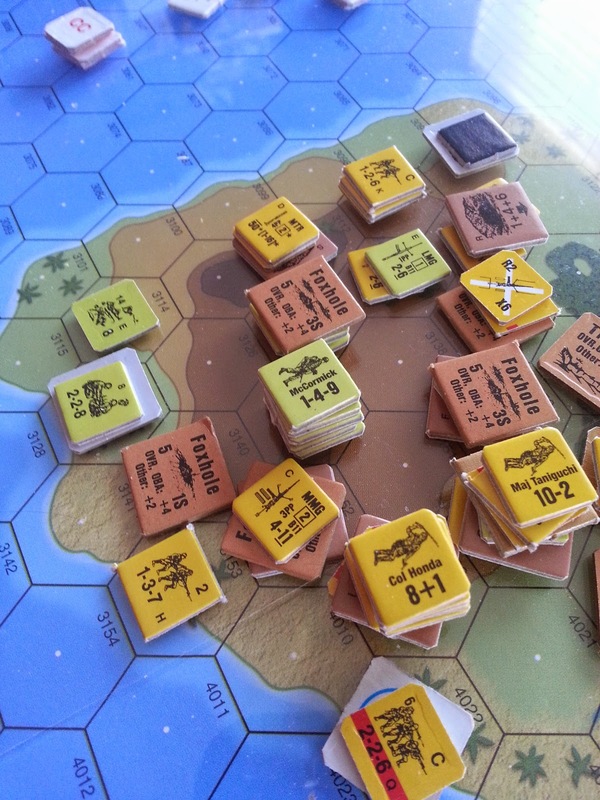 The second wave went well enough, with two Marines company committed and all remaining Naval OBA. Japan's grand plan was to make the US pay for each hex: they did. By turn 9 of the 2nd assault period, there are not enough IJA squads left to eliminate to compensate for the US deficit on CVPs. I doubt that Japan can hold out for two more assault periods, but the US can't do it without unacceptable casualties. The US didn't see this one coming until it was almost too late: getting the first wave completely wiped out will do this to the CG. The line when the outcome was decided. Too much risks were taken in wave 1 trying to collapse caves that weren't unoccupied. DC aren't that effective against cave without the bonus when the cave is empty. NOBA is useless in close support because two OBA cards must be drawn when within 6 hexes of friends. Air strikes on enemies in the jungle have a high chance of ending in friendly fire. Japan's defense must be made of concentrated fields of fire from cave locations and timely use of counter attacks. 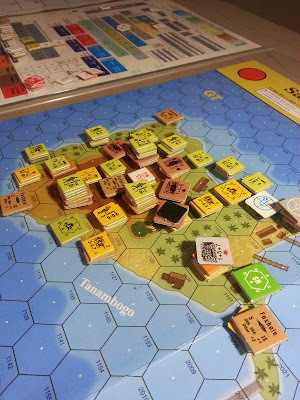 Japan can only win the CG by causing LOTS of CVP. Shooting from the other island and from caves makes it incredibly difficult for the US to deal with. Conversely, US tactics must minimize loss. This implies an incompatible mixture of patience and seaborne assaults. This was a wild CG to play rulewise. But also a lot of fun. I'll play simpler ASL for a while but sure will come back one day to Gavutu and Tanambogo. It took a whole lot of time for the Marines to land on the North shore of Tanambogo. 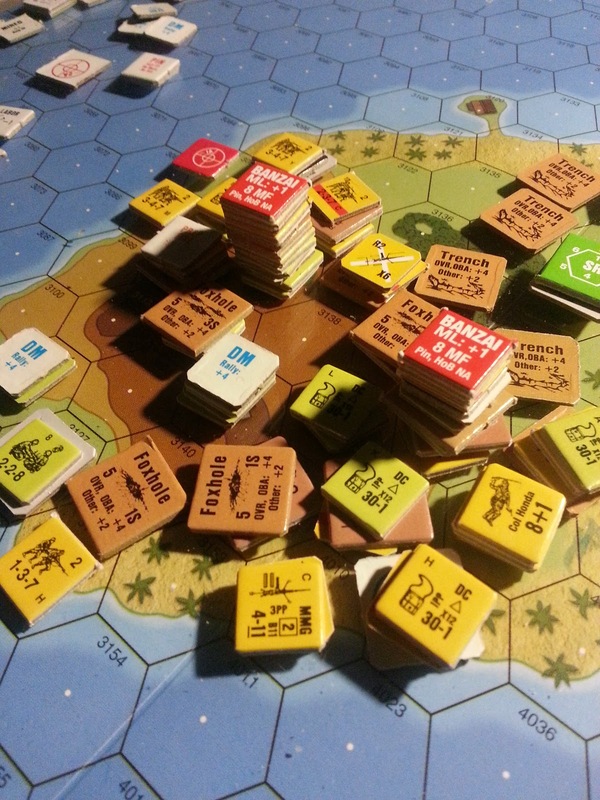 The presence of huts and the narrowness of the landable area took the best of 6 turns to get everyone on shore. 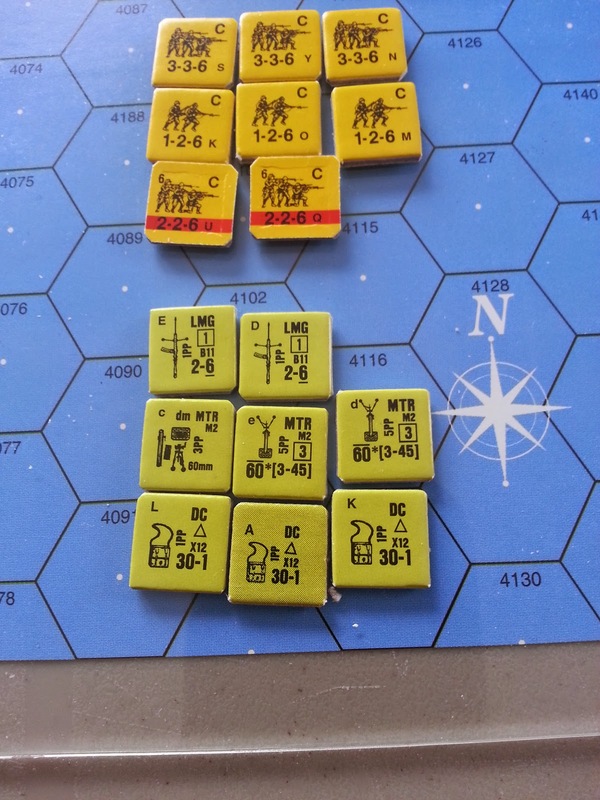 Artillery fire from Gavutu and a few well placed MGs kept on breaking the marines in their attempt to encircle the hill. The island is mostly in US hands now. The Gap in CVP favours Japan by about 20 CVPs. There may be up to 30 CVPs worth of IJA units left on the two islands. If the marines lose more than 10 CVPs, they will take the islands but lose the CG. 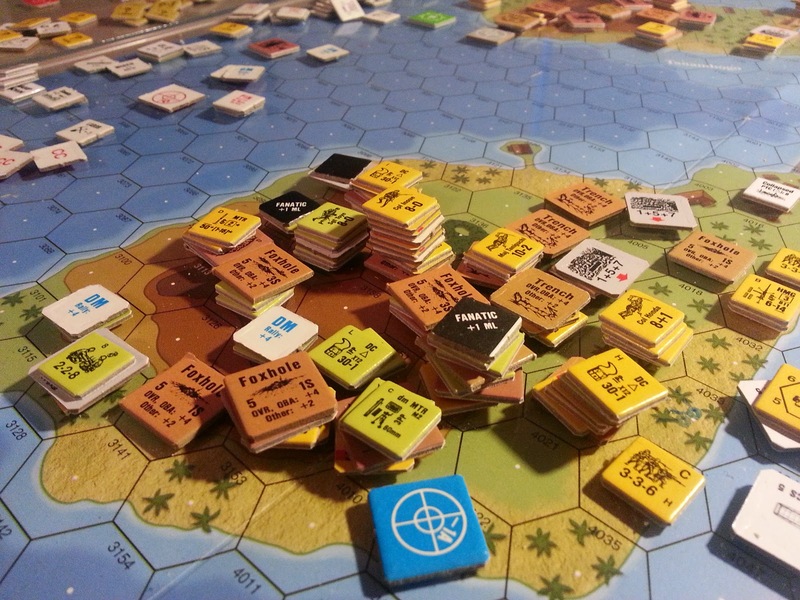 So, once more, ASL pulls the edge-of-seat feeling as the US must now play 0 casualties while clearing another island with a double cave complex stuffed with HMGs, MMGs, a bunch of captured 60mm MTR and a 70mm INF. This calls for night action, landing the tanks, and keeping all toes and fingers crossed. Let's cut the crap and admit that every single marine from the 1Para is gone. This came at a cost for Japan. So I decided to go for broke and land two companies back daylight. All of the NOBA is committed and so is a flight of close air support. The plan you may ask? 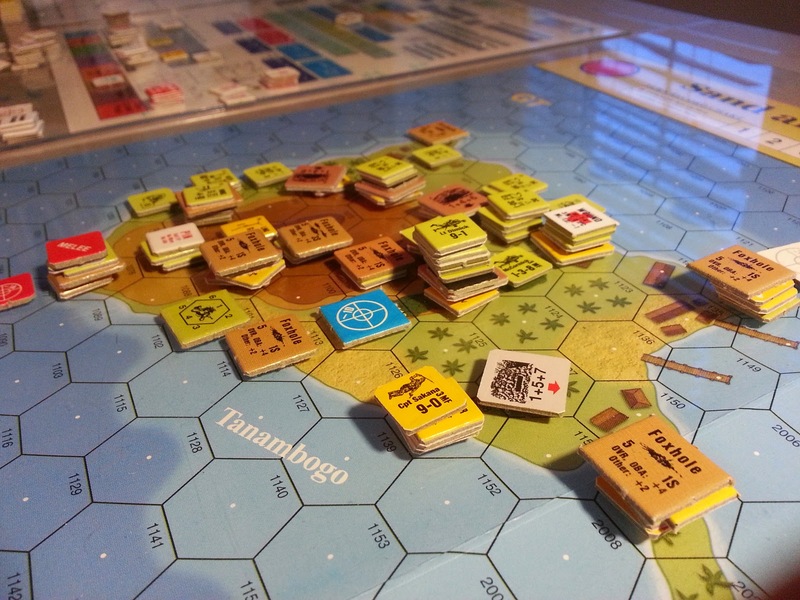 Land on Tanambogo, pound anything that is farther away from 6 hexes of the troops with NOBA, CAS on turn 3-4. The landing site isn't beach, but it doesn't matter with this kind of LC. The objective, take the island before nightfall. Landing area: congested but well supported by MG fire. Running inland on the left got complicated when fire from a number of mortars, the 70mm INF and MG fires converged on any given hexe of the hinterland. The SNLF are out of sight on the hill, waiting for the marines to attempt to gain the high ground out of the LOF from the caves. Pushback: Amazing how captured marine 60mm can clear an area from a distance. Close air support was effective in suppressing some mortars and striping the SNLF. Where I thought that Japan was fighting a losing battle, I'm starting to think that it will be a close one once again. The CG is running its course. During the USMC turn 8, the americans tried to push back the japanese from Hill 148. Their firepower is thinning because of the numerical inferiority. Also, a 4MC still only step reduces and degrades the charging japaneses, but doesn't stop them from coming. The good news is that almost all US units have rallied. You got to give it to the Yanks: they know how to snap off a DM counter when it is really needed. View from the West: the line has not changed. 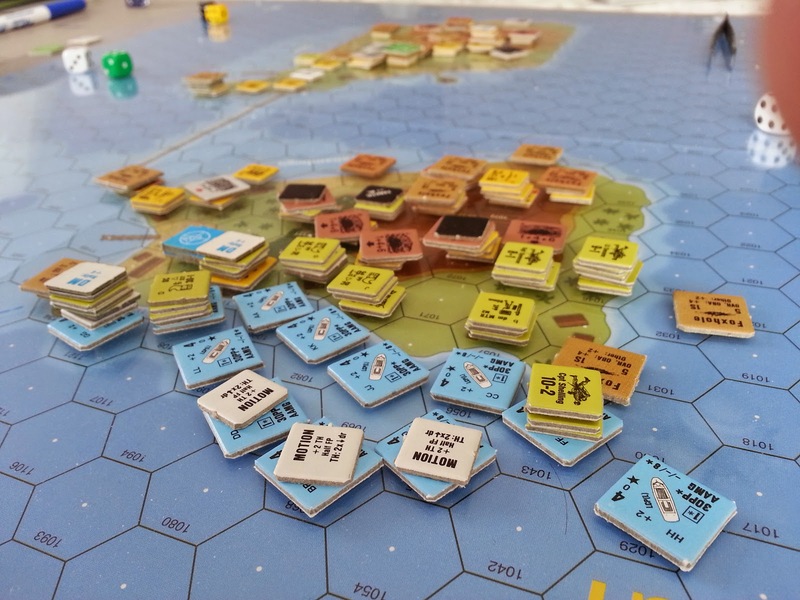 A lot of japanese infantry has died, but the surge isn't stomped. Luckily, most of the stacks are now step-reduced and ELR'd. Will this be good enough to withstand the next two minutes. View from Bloody beach: Everyone has climbed up on Hill 148. A few fresh brokies are low-crawling downslopes. Murderous MTR fire is raining from a pier to the North. On the far left, japan is on top of the hill and encircling a small patch of jungle. On the centre, a large number of high-quality SMCs and fresh squads are in position for a Banzai charge. On the right, a number of degraded troops are swerving around the beach. A lone crew is keeping an eye on Bloody beach to keep a lid on the caves and the pillbox. Banzai charges have crept on marines from the North-West and the Eastern beach. 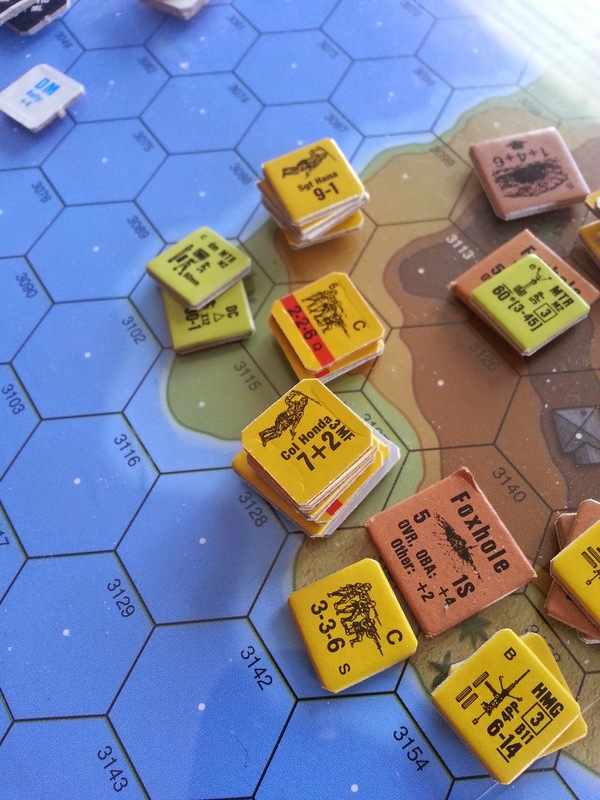 The marines guarding the eastern edge weren't as lucky and got swept by large Banzai charge. The flank of the marine's defense got wiped by a snakeye from the lousy 8+1 kill stack. Near the top of Hill 148, a huge pile of japanese took huge punishments on during their charge, but made it into the patch of jungle. The marines, however, crushed them on the spot during CC as their combined force had been decreased a lot via step-reduction. Shortly after the storm while bracing for another one. The marines consolidate their position as the noose is getting tighter. A hero rises among the troops hiding in the communication building on the crest of Hill 148. The view is great, but the neighborhood is going downhill. Japan swept the marines in the communication building, but the banzai charge on the foxholes gives a chance for the marines (mostly broken), to withdraw without fighting. There is not a lot of ground to give anymore. The marines are running the gauntlet around a squad of conscripts to avoid the bulk of a giant banzai charge in the making. DFF from the hill is terrible and both remaining leaders are killed in action. The faithful crew that is positionned in the palm trees holds the line on the edge of the beach. Hey sarge, why are we still lugging this dm mortar again? 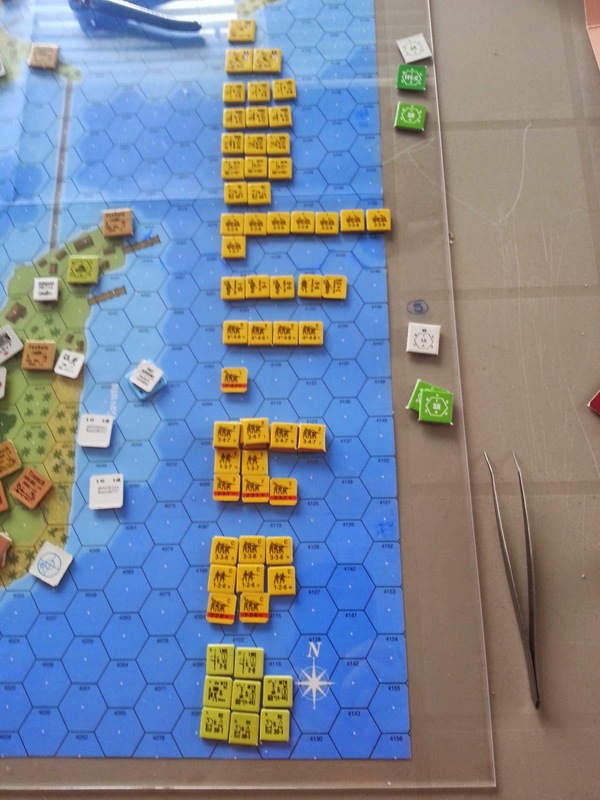 Japan threw its best Banzai charge at the remaining marines. The result was pyrrhic: the marine took the best Japanese leader down with them on their way to Valhalla. At this point, the Japanese part of my brain started to wonder whether this was a worthwhile charge. The valiant crew finally succumbed to a banzai charge, but not without shoving something hot and sharp up Col. Honda's landing gear. When the fire died down, there was much to collect on the battlefield that was made in the US of A.
Col Honda has outdone himself. The US invasions of Gavutu-Tanambogo has been averted, at a great cost. Japan's OOB going forward. Only one cave entrance collapsed. Enough to hold? Japan's loot by the end of the assault phase.